TF Est. 1968 is defined by movement and a fun spirit. 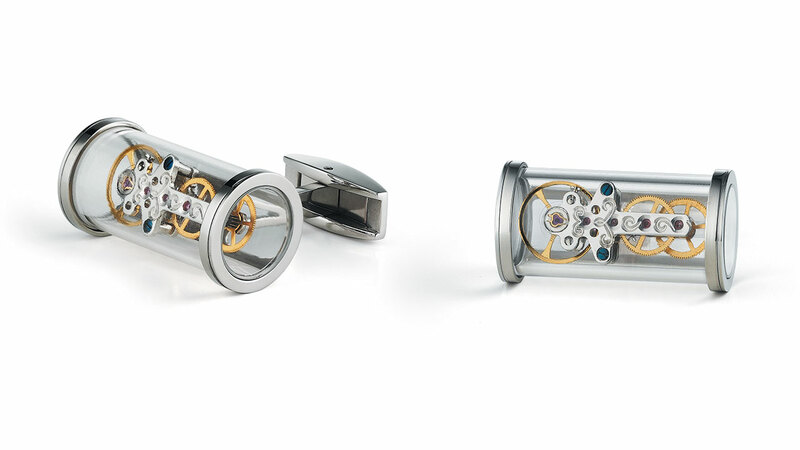 True to form, it puts a new twist on its famous watch-inspired cufflinks. This time all is revealed thanks to a tube in PPMA glass with sapphire treatment, made to withstand scratching and any other form of aggression. It reveals fragments of an authentic watch movement, vertically-mounted inside the tube. After all, vertical is in vogue! In an amazingly short space of time, TF Est. 1968 cufflinks, along with other accessories such as coordinating pens, key holders, even watches, have carved out a place at over 500 points of sale worldwide, not least at prestigious watch and jewellery retailers. The man behind this success story is Freddy Tschumi, a firm believer in Swiss craftsmanship. Of German quality, the clip closure is stable with a reassuringly frank click. The flowing, polished curves respect the most luxurious fabrics, whether a man's shirt or a woman's blouse. In steel, pink-gold plated and black PVD.